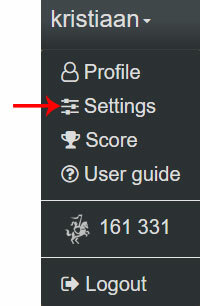 To access your settings, go to the user dropdown menu (click on your user name on the black navigation bar at the top) and select settings (figure1). Interface language: This is the language used for the interface, i.e. all buttons, menu items, messages etc. are shown in this language. My language: Also called the target language, this is the language used for the translation of sentences. It is the same language as the one defined in the second language dropdown in the story list. As the name implies this is typically your native languages. If your native language is not listed, choose the language you know well. Mind you, it must be different from the language you are learning. Background: The background image, which changes every month, can be disabled here in case you have a slow network connection or if you just don't like the images. Countdown: When you start reading a story for the first time, you will see a countdown animation, which counts down from 3 to 1. Here you can disable the countdown if you want to skip it. Duration: Only visible if the Countdown is enabled. The duration specifies the countdown time in seconds. By default it is set to 3 seconds. Ranking gender: You receive a rank title depending on the amount of points you have earned while reading stories. Each rank title has a male and female variant (e.g. Duke or Duchess). Here you can choose which variant you want to see displayed for your title. This gender will also be used when you see the rank title of another user (e.g. on his/her public profile). This means other people cannot know which gender you have selected, even when seeing your rank title. Click on the green 'Update settings' button for changes to take effect.